Ambius, the group responsible for the plants decor in Central Park on Oasis of the seas, was "recognized for excellence in plantscaping sector" at the 18th annual PIA Interior Plantscape Hall of Fame and Awards Banquet at the CalScape Expo 2010 on September 2nd, 2010 at the San Diego Sheraton Hotel & Marina. Amibus' Mark Hawry accepted four awards for his teams work on bringing the best of land to sea with the Central Park project for Royal Caribbean's Oasis of the Seas ship. Central Park showcases a revolutionary design that features a center of the ship that is open air and features lots of lush plant life. Central Park serves as a public area with pathways, seasonal flower gardens and canopy trees. It provides cruisers with another and unique choice in outdoor space. Hawry accepted three Award of Excellence citations for Oasis of the Seas including oversight of the Exterior Garden, the installation of Central Park and the design and provisioning of the ships' silk replica and preserved foliage. Central Park on Oasis of the Seas also picked up the prestigious Judge's Award, which was awarded for the most outstanding overall project in 2010. Showcasing onboard experiences all her own, Royal Caribbean International's Allure of the Seas, the world's next largest and most innovative cruise ship debuting in December 2010, will introduce new culinary concepts and tempting twists to signature Oasis-class restaurants. A Brazilian steakhouse will be a destination restaurant that comes to life for dinner service in the Solarium, featuring authentic Brazilian-style meats and seafood dishes, from Picanha cut sirloin steak to Atlantic salmon marinated with sea salt and garlic, served table-side and sliced straight off the skewer. In Central Park, recently anointed Chef de Cuisine Molly Brandt will present guests with a one-of-a-kind menu and distinct dining experience at Allure of the Seas' 150 Central Park, a signature fine dining experience. "As churrascaria concept restaurants gain popularity on land, Royal Caribbean is taking advantage of having a new ship to introduce a Brazilian steakhouse and bring a new dynamic and colorful nightlife ambiance for adults in the Solarium," says Lisa Bauer, senior vice president, Hotel Operations, Royal Caribbean International. "Guests onboard Allure of the Seas will have a new arrangement of dining experiences throughout the ship, from the Adagio Main Dining Room to new venues on the Boardwalk and Royal Promenade." Combining the best of classic Mexican beach bars and Southern California's famed taquerias, Rita's Cantina will be a vibrant new restaurant in the Boardwalk neighborhood. Adults and kids alike will enjoy some of their favorite Mexican fare, such as shrimp ceviche tostadas, warm tortilla chips with salsa and fiesta guacamole, as well as entrees, such as fajitas, fish tacos and Chipotle-style flautas. The more casual setting will be a favorite lunch, snack or dinner spot for guests seeking a flavorful fiesta onboard Allure of the Seas. Rita's Cantina also will boast some of the best and widest selection of margaritas at sea, offering both authentic and signature concoctions mixed with a choice from the extensive list of quality tequilas, served on the rocks or frozen in a variety of fruit-flavor combinations. In addition, the restaurant will introduce new nightlife to Boardwalk with live guitar music, drinks and dancing. Rita Cantina's design will include large open breezeways and an outdoor seating area complete with high top tables and stools, and will be located in place of Seafood Shack onboard sister-ship Oasis of the Seas. Also new to Boardwalk's dynamic and engaging scene will be The Boardwalk Dog House, an outdoor hot-dog specialty counter located where The Donut Shop is on Oasis of the Seas. Guests can choose from traditional hot dogs, wieners, brats, sausages and other delicious linked meats and a variety of toppings to split a long bun. The Donut Shop will remain on Boardwalk in a new location next to the Ice Cream Parlor. Royal Caribbean Cruises Ltd. announced today it has named Gabriela Gonzalez Saul managing director for their operations in Mexico. In her position, Gonzalez Saul will lead the new office in Mexico, which will open in December 2010 to support the Sales, Marketing and Commercial Operations for the company's three cruise brands: Royal Caribbean International, Celebrity Cruises and Azamara Club Cruises. "We are delighted to have Gabriela join our team," said Michael Bayley, executive vice president of international for Royal Caribbean Cruises Ltd. "Gabriela's experience developing new business and increasing product awareness will be invaluable in this new role of managing our Mexican activities and implementing our market growth strategies." "In her new role, Gabriela and her team will build on the success and strong position we have achieved in Mexico, as well as further strengthen our ongoing commitment to providing unique and award-winning cruise experiences to the Mexican market," Bayley added. Gonzalez Saul has more than 20 years of experience managing business relationships, increasing market penetration and generating significant profit. She spent 16 years in various roles of increasing responsibility for American Express in Mexico, where she handled business development, product awareness and marketing strategies. Gonzalez Saul received a degree in International Commerce from the Academia in Maddox, Mexico. A research team from the United Kingdom's Greenwich University completed some "ground-breaking" research into ship evacuation and safety while using Royal Caribbean's Jewel of the Seas as a laboratory. More than 2,300 passengers aboard Jewel of the Seas took part in a 'live' assembly drill while at sea. The evacuation response time was monitored by the research team with a about 100 video camera, including CCTV, fish-eye, digital and analog cams that were pre-positioned by the research team. Passengers wore infrared tracking tags during the experiment, which lasted about a half hour. This allowed researchers to track everyone's exact movements and later reconstruct the paths people took to make their way to their assembly station. Head of the research team Prof Ed Galea, who is also director of the fire safety engineering group at Greenwich, said the experiment on board the Jewel of the Seas had created nothing less than a piece of maritime history. "This assembly trial was unique in several aspects, as we collected data from a large cruise ship, during a virtually unannounced assembly drill and while we were actually at sea," he said. This research on Jewel of the Seas is part of a three year Safeguard project that is being funded by the European Union with a cost of more than €3 million with a purpose of analyzing evacuation procedures on a cruise ship, specifically the length of time it takes passengers to respond to an alarm. The goal of this research is to improve current evacuation procedures. Tracy Murrell, director maritime safety and compliance for Royal Caribbean Cruises, said: "We are extremely pleased with the success of the exercise onboard Jewel of the Seas. The shipboard team embraced the spirit of the exercise and assisted in all aspects to ensure flawless execution. Royal Caribbean is proud to be part of the ongoing efforts to improve safety onboard passenger ships and looks forward to learning from the results of the project." If you like playing those scratch off lottery games and are a fan of Royal Caribbean, now you can combine your favorite two passions in one. Starting today, the Florida Lottery will be selling a new scratch off game with a Royal Caribbean theme called "Cruise for Cash". 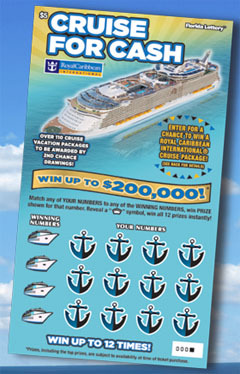 Tickets cost $5 and the game offers players the change to win up to $200,000 instantly and a second chance promotion on the Florida Lottery website has the possibility to win a 7-night Caribbean cruise vacation for two aboard Oasis of the Seas or Allure of the Seas. The new game is available at Florida Lottery retailers statewide. If you win the cruise, you also will receive $1,000 in ship credit and premium accommodations for two at a deluxe hotel prior to departure. There will be a total of 112 cruise packages awarded with this game. Cruise winners will have the option of selecting from various Royal Caribbean International cruise vacations, subject to availability and the terms of the CRUISE FOR CASH game. Royal Caribbean Cruises Ltd. announced today it will establish a dedicated corporate office in Mexico City in response to the increasing interest in cruising in Mexico. 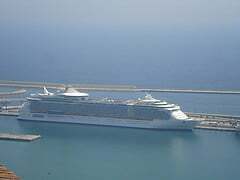 The new office will open in December 2010 to support the Sales, Marketing and Commercial Operations for the company's three cruise brands: Royal Caribbean International, Celebrity Cruises and Azamara Club Cruises. American Express will continue representing Royal Caribbean in Mexico until the end of 2010, to allow for a seamless transition. "American Express has successfully served as the international representative of Royal Caribbean's business in Mexico for the past 15 years, and their excellent team has done an outstanding job building a solid foundation in this expanding market," said Michael Bayley, executive vice president of international for Royal Caribbean Cruises Ltd. "In our new business model, American Express will continue to play an important role by becoming a preferred distribution partner for their own sales channels in Mexico. We look forward to continue building our business together," Bayley added. "American Express is proud to be a part of the Royal Caribbean history in Mexico," said Daniela Cerboni, vice president and general manager of American Express Membership Travel Services International. "For many years we have worked together to grow the Royal Caribbean business and the cruise industry in the market. We look forward to the opportunity to work with Royal Caribbean in the future, and plan to continue to strengthen our long standing partnership, offering even more valuable cruise benefits to our American Express Cardmembers in the market," Cerboni added. The opening of Royal Caribbean's Mexico office is strategically timed. All three brands already enjoy very strong positions in various segments of the market and a dedicated office will provide an opportunity to further strengthen the market leading position. "Our research shows that our Mexican guests really enjoy our various brand, product and destination offerings," said Bayley. "This coupled with the knowledge that Mexico already is a substantial source market for new cruise guests, and a great geographic location on the doorstep to several exciting and appealing destinations, illustrates the great potential for growth in Mexico." Johanna Jainchill is reporting that Allure of the Seas' construction is ahead of schedule, which is good news for Royal Caribbean that is eagerly waiting for its newest ship to debut. 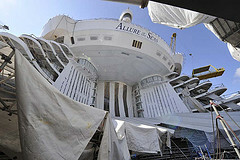 While visiting the STX Finland shipyards in Finland, Jainchill reports progress on Allure seems to be ahead of its sister ship Oasis of the Seas was at the same point in her construction schedule. During a tour of the Oasis at this time last year, the theater was all scaffolding. Today, the Allure’s theater appeared ready for the cast of Chicago to start rehearsals.The loft suite one year ago was metal and wires. Today, it was ready, with the bed made and bathroom products on the sink. The cupcake shop was merely a shell one year ago. Today, it was only lacking actual cupcakes. 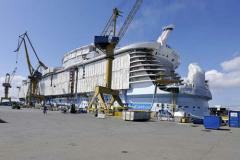 If you're thinking that because Allure of the Seas is ahead of schedule that the ship will debut sooner, think again. Royal Caribbean CEO Adam Goldstein reiterated that Allure of the Seas will stick to the schedule she is currently on and would not take an even earlier delivery of the vessel. Royal Caribbean has already moved up the Allure’s inaugural cruise twice, "The program was so locked in with the arrival and training of the crew and the transatlantic [voyage], and we already sent the invitations out for the South Florida [inaugural] events. We will stick with what we have scheduled." The Maryland Port Administration has awarded a contract to TEAM to design and build a Passenger Boarding Bridge for the South Locust Point Cruise Terminal in the Port of Baltimore, Maryland, USA. The new bridge should be ready in 2011. This passenger bridge, which connects the cruise terminal with a cruise ship, will be the first of it's kind and will consist of an enclosed mobile walkway that is fully air-conditioned. The tunnel will have four fixed tunnel sections leading from quay level up to 7 meters in height. At its heighest point, there will be an integrated rotunda that connects the walkway module with a 3-tunnel telescopic boarding bridge known as KRONUS. The KRONUS is also air-conditioned and features next to anelectro-mechanical driving system an electro-mechanical lifting system to reach the required highest and lowest elevations and match up with ship shell doors on various cruise ships. If you're looking for a cougar cruise, there's a new one that has been announced, but you will need to get to Spain to experience this one. 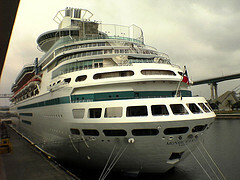 Royal Caribbean's Liberty of the Seas will depart from Barcelona and cruise April 16-21, 2011. This cruise comes after cougar cruises have been banned by the three largest cruise lines in Australia, and also by Carnival, the world's largest cruise line, in the USA. "We are pleased that Royal Caribbean will be hosting our European Cougar Cruise," says Rich Gosse, Executive Producer of http://www.cougarevents.com. "While it is perfectly acceptable for middle-aged men to date women their daughter's age, women don't have the same privilege. After the tremendous success of the world's first International Cougar Cruise, December 2009, aboard Carnival, we were shocked that they refused to allow another. If there had been problems on the first Cougar Cruise we would understand being banned. But hundreds of our cougars and cubs onboard were well-behaved, and there were absolutely no problems. We expect the same will be true with the European Cougar Cruise." A blogger for a New Zealand web site is in the middle of a 10 night cruise and had to report that while everything on the cruise ship was great, what was really awe inspiring was the fact that their two young sons have stopped fighting thanks to the fun of the ship. The squabbling and bickering has stopped and no one has punched, pinched, kicked or dobbed on anyone for ages. "They're not fighting," my wife whispers, noting that our two boisterous young sons are acting out of character. Their sons were enrolled in the Adventure Ocean Kids' Club and it sounded like they were happy with the experience in the club. We can look forward to three themed sessions every day. On selected evenings the staff also host casual dinners so parents can eat alone. Elsewhere onboard there are activity sessions and playgroup meetings for babies and toddlers. And, next to a video-arcade room, is a "teen-only" dance club and lounge room for the older offspring. They have organised activities, too.